Run by Lumenia, an independent ERP consultancy, the ERP HEADtoHEAD™ provides plastics manufacturers with a unique opportunity to meet, compare and experience the leading ERP vendors and their products. Taking place on 12 th and 13 th March 2019 at the MK Dons Stadium in Milton Keynes, 12 of the UK’s leading ERP vendors will go head-to-head to demonstrate their ERP solutions. 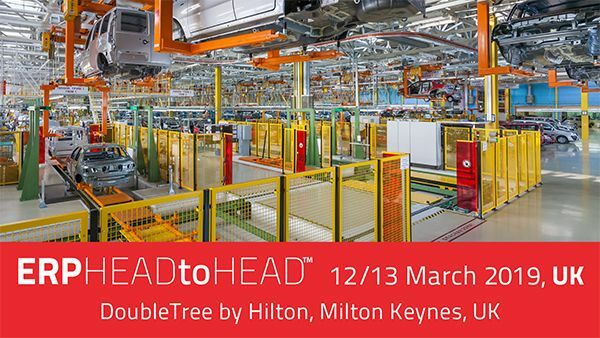 For manufactures planning to select, upgrade or replace your ERP system, the ERP HEADtoHEAD™ event is the ideal platform, providing an ideal opportunity for senior finance or IT executives and members of their ERP selection teams to efficiently review and compare the leading ERP products. Solutions suitable for various organisation sizes, from large corporations to SME’s, will be represented. Other ERP solution providers joining IQMS, include SAP, IFS, Epicor, SAGE, Microsoft Dynamics and Infor. As well as learning about IQMS’ solutions, attendees will also have the opportunity to learn more about how IQMS fits into Dassault’s 3DEXPERIENCE platform, after Dassault completed the acquisition of IQMS earlier this month. March’s event is the twelfth event run by Lumenia, having been originally established by Lumenia Managing Director, Sean Jackson. “One of the pitfalls you can fall in to when selecting a new ERP system, is to rely solely on the vendor’s sales demo. Each vendor will have their own interpretation of what they think you are looking for, which makes it difficult to make comparisons.” says Jackson , “What you need the vendors to do, is to follow a demo script so that you can compare. This is the fund amental idea of the ERP HEADtoHEAD™”. The event takes place over two-days and is facilitated by Lumenia Consulting. On Day One, all vendors take part in an ‘ElevatorSpeech’ to introduce themselves. During this session vendors present a summary of their USP’s to convince delegates why it would be a good idea to attend their demo. Delegates can choose to attend sessions focused on Finance, Production, Procurement, HR, Projector Sales. Each demonstration lasts 60 minutes and is based on defined high-level scripts. Day Two includes the opportunity to hear a panel discussion, comprised of industry end-users sharing their experiences on how to avoid ERP implementation mistakes. Attendees can also hear thought-provoking, vendor-independent presentations from Lumenia Consulting on ‘Are you ERP Ready?’ (on Day One) and ‘Characteristics of Successful ERP Projects’ (on Day Two). There will be lots of opportunities for delegates to meet with ERP vendors within the expo area and to network and compare experiences with other organisations also planning to implement ERP. “Good opportunity to compare different ERP systems over a short timescale. Good event – worthwhile attending”. “Good overview of the ERP Process. Suppliers very helpful and knowledgeable. Good scripts giving apple for apple comparisons”, commented previous event delegates.